If you’re seeking sushi off the Las Vegas strip, chances are you’ll wind up on the valley’s west side since it is dominated by some of the most popular sushi joints in town. Sushi Mon provides an all-you-can-eat experience, but for smaller appetites Spring Valley’s Naked Fish’s and Hokaido, both Japanese owned, have earned the reputation for the best sushi. Hokaido has long been my favorite neighborhood haunt, but I thought it was time to stray and try Naked Fish’s to see how it measured up. 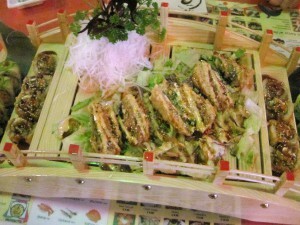 Hokaido Sushi is located in a strip mall on Fort Apache near Sunset Road. They offer delivery, take out and a quaint dining room with friendly service and two talented men behind the sushi counter, Chef Eric and JJ. They are meticulous with every cut of the knife, they create stunning presentations and combine flavors that are equally remarkable. The sushi menu is wide and varied, rolls start at $4 and can run up to $12.50 for specialty rolls. I’ve sampled more than a dozen varieties and I’m yet to taste one I did not like. Favorites include “What the Hell” ($12.50) with spicy tuna, cream cheese, and jalapeno, “Kamikaze” ($11.00) an eel tempura roll with spicy tuna and avocado and the “Rock ‘n Roll” ($12.50) offers five kinds of generously cut fresh fish and crab wrapped in cucumber. Classics like spicy tuna ($6) are well executed, as well. If you’d prefer to have Chef Eric create a personal selection, requests are honored. Presentations at Hokaido will woo you and the flavors will wow you. You might be served a boat or bridge with your selections. You can also expect fresh flower garnishes or radishes and carrots carefully shaped into butterflies and flowers. The deliciousness does not end with the sushi, an array of Japanese dishes are available too. Bento Boxes (2 items, $11.95) are popular as well as the udon noodle dishes. Naked Fish’s Sushi and Grill is located on Durango Rd near Twain Ave, also in a strip mall. They cater to those dining in and they keep late night hours, closing at 2am. The dining room is cozy and autographed Cirque Du Soliel posters line the walls. Service on our visit was disorientated and the sushi chefs were distracted by Sake Bombs, our first impressions were not stellar. We stuck it out and ordered a few specialty rolls from their extensive sushi menu. Our server advised us against “Kiss Me” and suggested “GT-R” ($12.50) instead. We also sampled “WSOP” ($12.50) and “Lisa, Lisa” ($12.50). 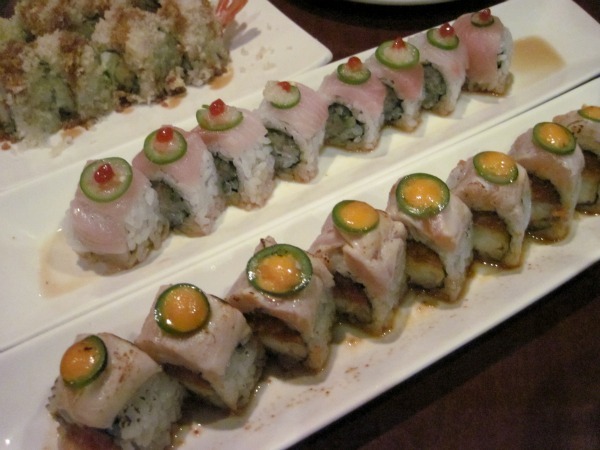 We were only fond of the “WSOP” a Hamachi roll with fresh yellowtail and spicy jalapeno. There was none of the razzle dazzle seen at Hokaido spotted here. The concept of Naked Fish’s is to prepare sushi that doesn’t need soy sauce and wasabi. I can’t say they met the mark on our visit. First impressions lead me to believe Hokaido Sushi has friendlier service, more creativity and better flavors than Naked Fish’s, and both are comparably priced. I do wonder if our experience was a fluke because Naked Fish’s earns many praises and has a large following, it’s even been named “Best Japanese Restaurant” by the Review-Journal. They offer lunch combos (from $8.95) 11:30am-3pm and a reverse happy hour from 10pm until close, which offers a few bucks off specialty rolls. Either special might be opportune time to give Naked Fish’s another try. On my last visit to Vegas, I did not have time to look for good sushi restaurants. Next time I go to Vegas, I will make sure and try these joints. Knowing that they are both Japanese-owned, I can expect good quality and the prices are not bad at all. Thank you so much for the tips.